The first fully Mobile Limited Finishing Work Station *large enough to paint bumpers. Spot Box Max has all the features you need to prep and paint the smaller jobs. Spot Box Max is designed to provide a safe environment for prepping and painting smaller jobs. 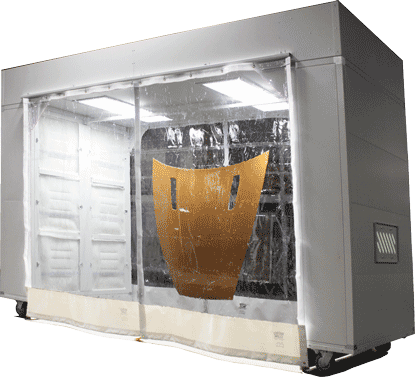 Increases your productivity by freeing up your paint booth for the larger jobs. Spot Box Max comes equipped with heavy duty castors allowing for more flexibility in your transitional work spaces. Electrical components, such as motors, motor starters, disconnect switches and push buttons are listed or approved for the Class or Division in which they are located. Conformance to all these requirements is dependent upon the manner in which the equipment is installed. The contractor will make certain that all of the electrical wiring and automatic fire protection systems and location of the equipment within the building conforms to the cited codes and other references. *14.3.2 The amount of material sprayed in a limited finishing workstation shall not exceed 3.8 L (1 gal) in any 8-hour period. NOTE: Fire suppression system is not included, but is required by NFPA-33.